New York Rangers President and General Manager Glen Sather announced today that the club has agreed to terms with forward Chad Kolarik on a contract extension. Kolarik, 25, skated in 49 contests with the Connecticut Whale and Springfield Falcons of the American Hockey League (AHL) last season, registering 21 goals and 20 assists for 41 points, along with 54 penalty minutes. 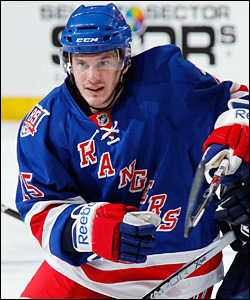 He was acquired by the Rangers from the Columbus Blue Jackets in exchange for forward Dane Byers on November 11, 2010. Kolarik ranked second on the Whale in goals and fifth in points despite missing 26 games due to injury. He established a Connecticut franchise record with two shorthanded goals, the first of his career, tied the franchise mark with four points (two goals, two assists) in the first period and tied the Whale season-high with a career-high, four points in a 6-3 win vs. Wilkes-Barre/Scranton on January 16. He also notched a goal in his debut with Connecticut on November 13 vs. Springfield. Forward Chad Kolarik appeared in four games with the Blueshirts last season after joining the team in a Nov. 10 trade with with the Columbus Blue Jackets. Kolarik tied for the Whale lead in playoff goals and ranked third on the team in points, recording three goals and two assists for five points in three postseason contests. Prior to his trade from Springfield, Kolarik registered four goals and six assists for 10 points, along with 18 penalty minutes in 13 games with the Falcons. He ranked third on Springfield in scoring with 10 points, tied for second in assists and ranked fourth in goals at the time of his trade. In addition, Kolarik registered one assist in four games with the Rangers last season. He tallied his first career NHL point with an assist while making his Rangers debut on January 20 at Carolina. The 5-11, 195-pounder has skated in 201 career AHL contests with the Connecticut Whale, Springfield Falcons, Syracuse Crunch, and San Antonio Rampage, registering 67 goals and 74 assists for 141 points, along with 156 penalty minutes. He split the 2009-10 season between San Antonio and Syracuse, recording a career-high, 26 goals and tying his career-high in scoring with 50 points in 76 games. He also appeared in two games with the Columbus Blue Jackets in 2009-10, making his NHL debut on April 5, 2010 at St. Louis. In 2008-09, Kolarik established a career-high with 30 assists and 50 points in 76 games with San Antonio. He made his professional debut with San Antonio on April 16 in the 2008 Calder Cup Playoffs, and notched a hat trick in his next game two days later. The Abington, Pennsylvania native was originally selected as Phoenix’s seventh round pick, 199th overall, in the 2004 NHL Entry Draft.